The Energy Policy Roundtable in the PJM Footprint is a new regional forum focusing on wholesale and retail electricity and gas issues in the PJM footprint (13 states and D.C.). Click here for our upcoming or most recent meeting agenda. FERC Commissioner Robert Powelson takes questions from the audience after his Keynote Address, “Let Markets Work: A FERC Perspective" at the November 28, 2017 Roundtable in the PJM Footprint. Acting FERC Chairman Cheryl LaFleur answers a question from Moderator Jonathan Raab following Keynote Address at June 2, 2017 Roundtable in the PJM Footprint. Dr. Jonathan Raab, President, Raab Associates, Ltd., serves as the convener and moderator of the Roundtable and is responsible for developing the agenda, securing speakers, and facilitating the meetings (www.RaabAssociates.org). 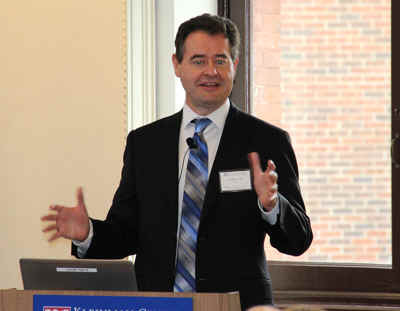 The Roundtable is hosted by Morgan Lewis at its conference facilities in Philadelphia and Washington DC. Bringing together thought leaders and stakeholders from industry, regulatory agencies, NGOs, technical and financial disciplines, and academia, for high level discussions on a quarterly basis, this new forum is supported by over 15 Founding Sponsors representing energy stakeholders from across the electricity and gas industries. Key State Public Policies in the PJM Footprint panel participants. (From L to R) New Jersey Board of Public Utilities President Richard Mroz, Public Utilities Commission of Ohio Chairman Asim Z. Haque, Pennsylvania Public Utilities Commission Chairman Gladys Brown (with microphone) and Moderator Jonathan Raab at June 2, 2017 Roundtable in the PJM Footprint. Stakeholder Proposed Approaches to Integration Into Markets panel participants. (From L to R) PJM Senior VP & General Counsel, Vincent Duane,NRG VP Market & Regulatory Policy, Peter Fuller, Senior Consultant, CRA (for NextEra, CLF, Brookfield), Robert Stoddard and Exelon Senior VP, Competitive Market Policy Kathleen Barrón take questions from Moderator Jonathan Raab at June 2, 2017 Roundtable in the PJM Footprint. Caption: (L to R) Panelists Dr. Joe Bowring, President of Monitoring Analytics, Stu Bresler, Senior VP for Operations and Markets at PJM, Alison Silverstein, Independent Consultant, and Moderator Raab during a Q&A at the November 28, 2017 Roundtable in the PJM Footprint, Pursuing Resilience & Ensuring Reliability in PJM’s Competitive Markets. 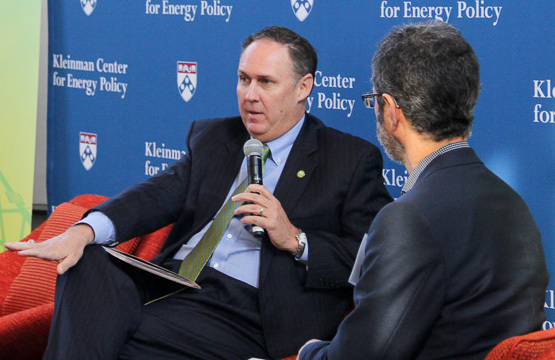 (L to R) Richard Kruse, VP, Texas Eastern (Enbridge), Don Santa, President & CEO, Interstate Natural Gas Association of America, Ralph Izzo, CEO & President, PSEG and Moderator Raab responding to questions at the November 28, 2017 Roundtable in the PJM Footprint, Pursuing Resilience & Ensuring Reliability in PJM’s Competitive Markets. 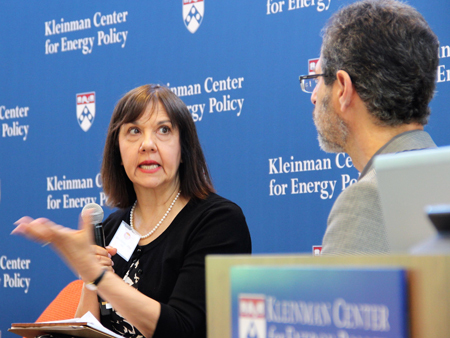 A Showcase Roundtable on Gas/Electric Integration Issues in the PJM Footprint was held at the Kleinman Center at U Penn on October 29, 2015. This successful event featured keynote addresses by FERC Commissioner Cheryl LaFleur, PJM CEO Andy Ott, and industry expert Richard Levitan, followed by a panel of leading stakeholders discussing the opportunities and challenges of gas/electric integration issues, including representatives from NRG, Exelon, Columbia Gas, PJM, and the Consumer Advocates of the PJM States. This exciting new forum in the PJM Footprint is modeled on the New England Electricity Restructuring Roundtable, now celebrating its 20th year. The New England Roundtable is also managed and moderated by Raab Associates, hosted by the law firm Foley Hoag and supported by participating sponsors.